"Hills' feathered heroes enact a dialogue familiar to anyone who has negotiated with siblings or playground rivals." "Every artistic decision underscores the humor with deft mastery ... Readers will hope to see more of this adorable couple." "The title characters have a big fight over a giant egg. When it turns out to be a ball, they learn to play with it together." 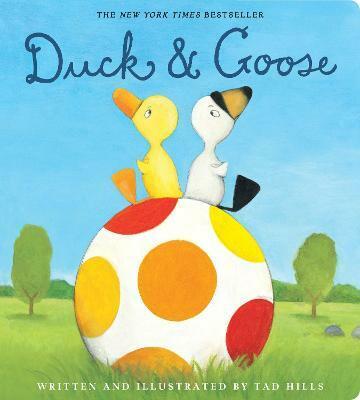 Tad Hills is the author and illustrator of the highly acclaimed New York Times bestselling picture books Duck & Goose; Duck, Duck, Goose; Duck & Goose Go to the Beach; How Rocket Learned to Read; and Rocket Writes a Story. He has created numerous Duck & Goose board books, among them the ALA-ALSC Notable Children's Book What's Up, Duck? ; Duck & Goose, It's Time for Christmas! ; Duck & Goose Colors! ; and most recently, Duck & Goose, Let's Dance! The Rocket series includes a board book, Rocket's Mighty Words, and two leveled readers, Drop It, Rocket! and Rocket's 100th Day of School. Tad lives in Brooklyn with his wife, their two children, and a dog named Rocket. Visit the author online at tadhills.com. From the Hardcover edition.